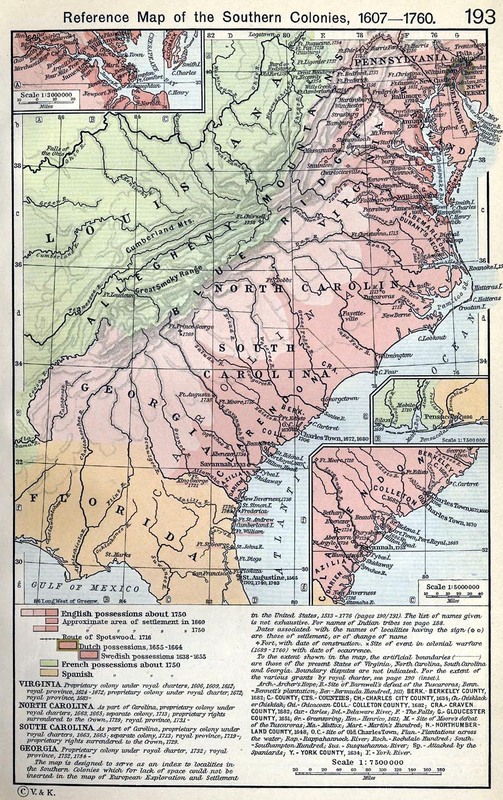 Virginia was the first of the English American colonies. In fact, until the middle of the Seventeenth Century, the entire Eastern seabord of the Americas was referred to as Virginia. The first colony formed was at Roanoke on behalf of Sir Walter Raleigh in 1585 and he named it Virginia in honour of Queen Elizabeth. This colony struggled to get going in the new lands and disappeared in a shroud of mystery. A new attempt to establish a colony at Jamestown in 1607 fared a little better. However, they found life in the new continent much harsher than they expected. Despite initial appearances to the contrary, the weather, vegetation and wildlife was far more different than they expected. Their equipment, knowledge and survival skills were far too limited in these hostile lands with the added complication of suspicious Indians. 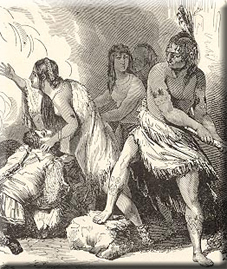 The colony declined sharply and would have been destroyed but for Captain John Smith (of Pocahontas fame). He managed to smooth relations with the Indians and to barter and trade vital supplies with them. The colony hobbled along for the next decade and a half. However, the colony was nowhere near as profitable as had been hoped. It was making nowhere near the returns on the investment expected. Furthermore, back in England, Puritans had invested heavily in the Plymouth and London Companies. King James was suspicious that the Puritans were hijacking these companies for political/religious purposes. Suddenly, in 1624 he withdrew Virginia's Charter. This change to Royal control was not as big an upheaval as the settlers expected. This was partially because of the timing. James died the next year and was replaced by his son Charles who was far too busy with the political problems at home to worry about political problems overseas. 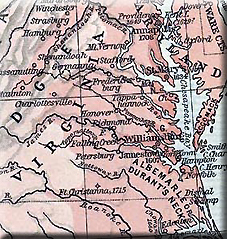 Consequently, Virginia continued to slowly expand in numbers and area although with the Puritans influence declining in the Virginia colony. The Puritans concentrated most of their energies into the New England colonies instead. The English Civil War nearly spilled over to the colonies. In fact in 1649, after the execution of Charles I, Governor Berkeley invited the King's son to come to Virginia to become the King of the Americas. However a Parliamentarian fleet was despatched to the New World instead. The Virginians quietly backed down and accepted the rule of Parliamentarian England. This was actually a blessing in disguise as the Roundheads were keen for the colonies to govern themselves. The colony would actually take on a more Royalist composition as many Royalist and Cavalier sympathisers from England emigrated looking for a friendly place to move to. The initial Virginian Royalist stance made it an obvious target. Despite the Royalist sympathies, the return of the Stuart kings in England did not give much benefit to the Virginians. Quite the contrary, King Charles II introduced severe Navigation Laws which stated that all goods must be transported in English ships - which of course meant that exports were going to be more expensive. The 1660s was a period of mercantalism and monopolies. The King was envious of the power of the Dutch East Indies Company with their virtual monopoly of the Spice trade and hoped to do something similar with the American colonies. In the end, he ended up stifling the colonies' trade and appointed people based on how much cash they could give him rather than on any particular administrative merits. Eventually, things came to a head with the 1675 Bacon rebellion. Nathaniel Bacon, at the head of several hundred men, marched upon Jamestown and burned it to the ground. Governor Berkeley fled before the armed invaders and took refuge on the eastern side of the Chesapeake. Disease did the job that authorities could not and Bacon's force was ravaged by Swamp fever and the rebellion subsided especially after the death of Bacon himself. The authorities were able to reassert control and the colony reverted to a fairly quiet period of slow and steady expansion. English settlers were joined by Huguenots, Scots, Irish and Germans over the next century. It still maintained some of its Royalist character and would remain one of the most loyal colonies in the Revolution.